Cut the white stems off of the leeks, and remove any green outer leaves. You only want mostly the white part of the stem. Slice each leek in half lengthwise, and rinse the leek thoroughly in water to get rid of any dirt held between its leaves. Place the leeks cut side up in a 13x9 baking dish. Brush the leeks with 3 tablespoons of olive oil. Sprinkle the leeks with salt and pepper to taste. Squeeze the juice from half of a lemon over top of the leeks. Sprinkle 2 teaspoons of chopped fresh thyme over the leeks. 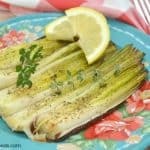 Bake the leeks for 20-25 minutes. Serve hot with fresh lemon wedges and sprigs of thyme for garnish.